Remember, your web visitor may not have more time to stay and read what all you have got. Generally, within three seconds, the message shall be delivered. And if your web content can’t catch web visitors' attention or fail to make a good impression then they are clickety-click and gone! It shall also be mentioned that your web visitor will be impatient as hell and will look for something more unique, something more of great value. The prospective customer will just scan your web page rather than read what all you have placed their on the site. So, here comes the role of the expert web content writer in Dubai. The writer will make sure that the benefits are clearly defined and sublime. Waffling on about business products or services won't take bring in any advantage. So, cut the clutter and be very simple and precise, effective and impressive. 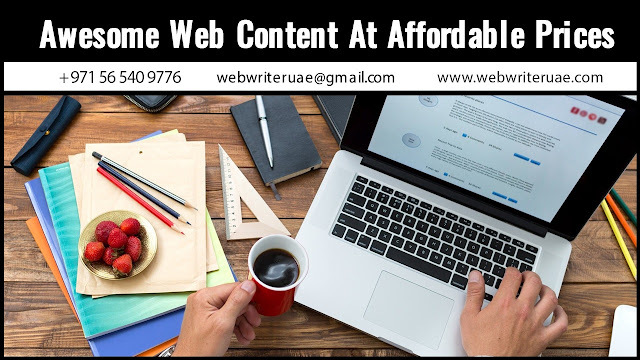 Take advantage of Web Writer UAE’s affordable web content writing services. So, what do you get when you hire Web Writer UAE for all your web content writing services in Dubai, UAE? Your Web Content Writer is experienced and knows more of how to deliver words that sell. Yes, you will receive words that really count. It is true that good design is crucial web component to create an impression on web users but it can’t convince or persuade the web users. It would be the role of the content you will be playing on the site. Your web copy will be unique. You will get nice bite-size chunks of effective content for your website or blogs or other marketing requirements. Simple, short but highly magical words or phrases which will define uniqueness of your business in the most influential manner. The tone, style of the content will be appropriate and will be as per your business image. Develop remarkable content in UK, US, Australian, Canadian English. You will receive content that is incomparably the best, replete in awesome quality.